If you want to read a little bit about this movie, you can find some info here . There will be a special Christmas class on Saturday the 12th of December in the beautiful Blue Spirit Yoga Studio, followed by a get-together at Gordon Falls Lookout with some great food. The class will be a donation class, all the money collected will go to the RSPCA in the Blue Mountains (you can donate any amount you feel comfortable with, even $1 can sometimes change a life). As I mentioned before, animals and their well-being is really close to my heart, especially if they were not fortunate enough to start their life in loving hands. That’s why I have decided to donate all the money collected from this first donation class to RSPCA in the Blue Mountains. Blue Spirit Yoga Studio, 5-6pm, 18 Murray St in Leura (the studio is located behind the house, you can find more information how to get there here http://www.bluespirityoga.com.au/ , at the bottom of this page). As the space in the Blue Spirit studio is limited (approximately 20 people), please register your attendance below. Optionally, you can text me on 0431 113 205, email me at veronika.treeloveyoga@gmail.com or let me know in class. If you could do that during next week or at least before Thursday the 10th of December, that would be much appreciated. If the class fills out and there are more people interested in attending, another class from 3:30-4:30pm will run on that day so that we can all share this beautiful practice together. Feel free to bring anyone else, friends and family are most welcome (please register their attendance as well). Picnic area at the Gordon Falls Lookout in Leura, from ~6:30pm, Lone Pine Avenue. Bring a little meal of your choice (vegan and vegetarian meals are welcome but not necessary) and water for yourself (or anything else you want to drink). Feel free to bring along anyone else. This email address is required in case there are changes to the Christmas Class. If you wish to sign up for Tree Love Yoga newsletter, please check the box below. Yay :-) It’s time to celebrate all the hard work we do in our yoga practice and that you are such wonderful people…I feel really lucky to have you in my life and I have thought it would be really nice to get to know each other a little bit more…and why not to do that over some beautiful food. 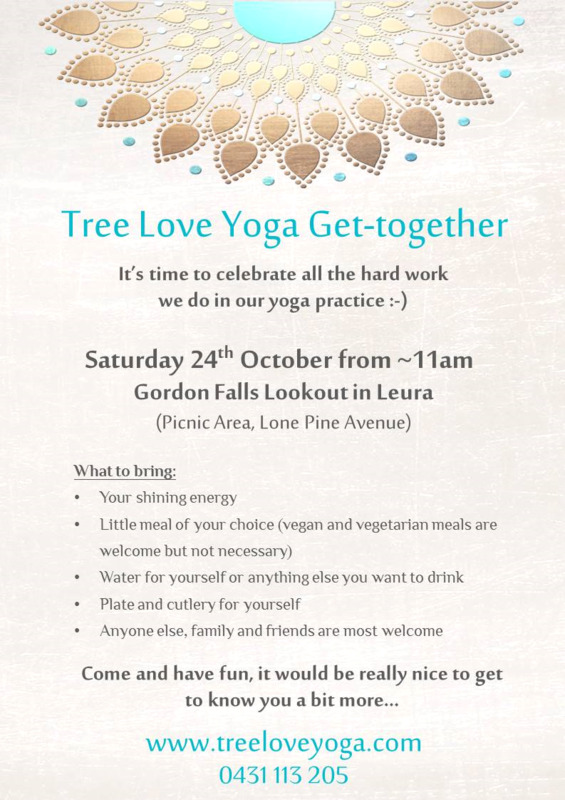 Saturday the 24th of October after the morning yoga class at Anytime Fitness in Katoomba we will have a little get-together. There’s a beautiful grassy area at the Gordon Falls Lookout in Leura (Lone Pine Avenue). Let’s meet there around 11am. While it is important to have goals and dreams in our lives, I feel as important if not more is to be able to be grateful for what we have now and where we are in our lives right now. It is something I am still learning myself and it’s something that always brings a different “kinder” perspective to my experience, no matter how challenging the experience may seem. Gratefulness is a tricky thing…it usually appears when we are happy but it often hides when we feel low and vulnerable, and when we need it the most. The great news is that with practice we can learn to bring a little bit more gratefulness into our lives even on those “gloomy” days. It’s best to start nice and easy, from appreciating things that we love and enjoy…I used to have a little journal and wrote down one thing every day (or when I had time) that made me happy that day…from flowering trees, fluffy dandelions, morning sun rays, to the incredible feeling of freedom I feel in dance, and time with my beautiful friends and family…when we start bringing more gratefulness into our lives, we start “seeing” more of the amazing things we already have…it’s almost like we start perceiving the world with new eyes and an open heart…all of the sudden the world seems to be a better place, we feel happier and more fulfilled day by day. The best thing about all of this is that over time, we will be able to become grateful even for things that seem hurtful or challenging at first. We will be able to see deeper into our experiences and will become more compassionate towards ourselves and the world around us. We will build a sense of no attachment (or lower attachment) to things that used to evoke strong emotions in us. There will come knowledge that everything has two sides and calmness that everything will pass. Gratitude is a powerful tool that can change your life…it really can…I swear. In the end, all of our experiences here are the matter of our attitude…the same thing can be seen as a challenge, or a blessing…it is up to us to choose what lives we want to live…with love and gratitude or with hate and anger? Take a moment this month to bring a little more gratefulness into your life…open your eyes…open your heart…I wish you that the month of October treats you with happiness, contentment, abundance and love. Yoga is a great way to become more physically fit, stronger, supple and vibrant. But it is also a great way to become more conscious of what is happening in the body and your mind. Which thoughts are sneaking in over and over again and what kind of feelings do these thoughts give rise to. Often when we feel something we don’t what to feel, we will have a tendency to do something about it. To fight what we feel, to run away, to numb our feelings in so many different ways…because we don’t want to stay there…however, when we do that, we don’t allow ourselves to gain a little bit more understanding into why, whether our response is appropriate or realizing that our mind has just taken us on a journey of imagination, filling in things that have not happened or totally distorting the reality. Sometimes we just want to run away from what we feel, because it may be too big for us to handle it RIGHT NOW…and it’s ok…don’t be hard on yourself and just allow yourself to take it one step at a time...start from little things…I do “love” to numb my feelings with chocolate, it feels good…for a moment…but many times now, I will choose not to…(don't take me wrong, I will have my chocolate whenever I want but when I realize it's because I want to run away from what I feel, I usually choose not to have it). When we practice awareness in our yoga practice and our life, we become more compassionate towards ourselves…we start loving ourselves more, understanding why we react sometimes in some way, why we feel a certain way and we grow kindness and patience towards ourselves. The more understanding we gain into who we are, the more the inner joy, the inner peace, the harmony within us will shine through...and we will become more compassionate towards others as well. A fundraiser to rebuild rural villages destroyed during Nepali Earthquake in April 2015 will be held in the beautiful Blue Spirit Yoga and Healing Space on Sunday the 14th of June. Sharing what we love, teaching yoga in our community, we want to help Sacred Journeys Nepal to raise some funds so needed in Nepal. There will be a morning and an afternoon session of yoga with three yoga classes in each. Please see below for further details and contact Julia for more info and to secure your spot.